University of Nottingham > Blogs > Sustainable Nottingham > environment committee > Looking for funding for a sustainability project? Apply now! The deadline for the next round of funding from the Environment Initiative Fund is approaching, so we’re taking this opportunity to explain a bit more about the Fund. What is the Environment Initiative Fund? 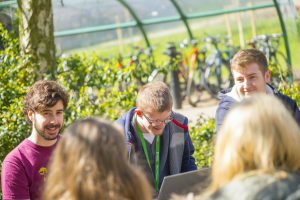 It’s a fund of £100,000 that the University’s Environment Committee awards to student or staff-led projects that promote, develop or enhance sustainable and socially responsible practices. The next deadline for applications is 1 March 2017. The fund is open to all University staff and students – individuals, groups or student societies are able to bid for funding. One of the aims of the fund is to enable a broad range of people to engage with sustainability themes, so we’re actively encouraging applications from those who are just starting to explore how sustainability relates to their work, study or life on campus. What sort of projects are likely to be funded? It’s a chance to make a positive difference. For students, it’s also a great opportunity to demonstrate your creativity, initiative, budgeting and project management skills – all important for employability! For staff it can be an opportunity to kick-start a sustainability project, bring together a multidisciplinary team or access match-funding. A short application form, along with tips for making a strong application, is available from http://www.nottingham.ac.uk/sustainability/getinvolved/eif.aspx. It’s worth bearing in mind that successful applicants will need to use the funding this academic year. All applications must be sponsored by a member of Environment Committee. For student-led projects the sponsor is Emory Cunnington – the SU’s elected Environment and Social Justice Officer, for staff-led projects it is the most relevant representative for your department or campus. This is great! Love this opportunity!